PRAYER PROMPT ••• I honestly forgot that fall had officially started until yesterday. I’ve been seeing so many comments on Facebook about the pending anticipation of all things pumpkin spice for so many weeks (by the way – Ew! ), it kind of diluted the arrival of the first day of fall. Not to mention, I’m a North Carolina girl. It’s still 80-something degrees here. It doesn’t feel like fall, though it’s definitely starting to look like it. Of the seasons, fall’s arrival is the prettiest to me. I realize there are those who would argue that spring is prettier but honestly, I spend so much time sneezing, I can hardly see the prettiness of spring… after all, you can’t sneeze with your eyes open. But fall is yet another opportunity to celebrate God’s goodness and consistency. He does what He promises. From the days of creation, God set the earth in motion. He Himself is the designer of spring, summer, fall, and winter! Throughout the Bible, we see examples of God’s consistent character. But we often overlook it in the obvious ways around us. Every 24 hours, the earth turns around and brings a new sunrise and at the end, a new sunset. Every month, we watch the phases of the moon play out against the sky. He designed all of it! And as we watch the seasons change, we see further evidence of God’s trustworthiness. Since He began the world, He’s never forgotten to give us a sunset and He’s never forgotten to deliver spring after months of winter. And now, He gives us fall. 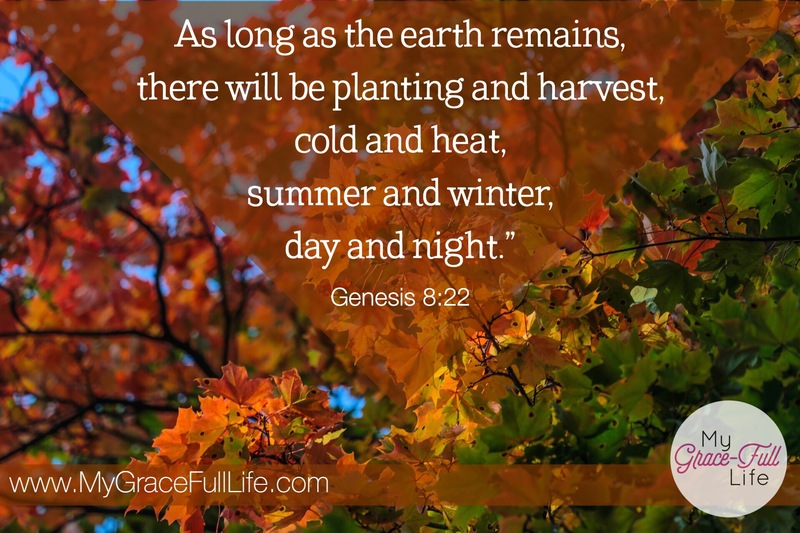 Today, as you pray, thank God that the change of seasons allows us to remember that He always keeps His promises; that while the seasons cycle through the year, God is the same forever and always.